A collection of 8 floor lights done in a futuristic style (with a touch of a retrofuturism) that can be used both indoor and outdoor. There is a mini version of each lamp. Modular design - each lamp made from 3 separate objects: base, emitter, and cage; summary there are 32 parts - feel free to recombine those into something new. Meshes are UV-mapped the way that any tiled material can be used to replace default one (copper). For best results use "Copper generic pristine" material from Real Materials vol. 3 package. For real time applications (like games, VR, AR) each model has set of LODs and a physbox. See "Home lights v1.0 [for real time].zip" file included in this product, both in FBX and blend file formats. Q: How to enable light from those lamps? A: They're using emissive material to lighten the scene. 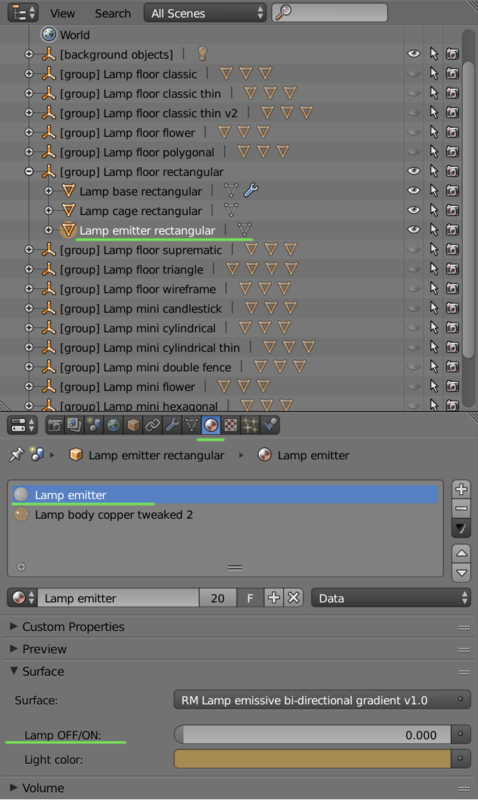 Select lamp emitter mesh, then in material tab select "Lamp emitter" material and set property "Lamp is OFF/ON" to "1"